Family & friends are invited to attend Visiting Hours on Wednesday, March 27th from 4:00 p.m. to 8:00 p.m. in the Vertuccio and Smith, Home for funerals, 773 Broadway, REVERE, for Ret. 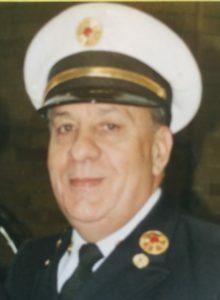 Sr. Revere Deputy Fire Chief George P. Taglieri, Jr., who died in the presence of his God and surrounded by his loving family on Saturday, March 23rd at Tufts Medical Center in Boston, following a brief illness. He was 78 years old. His funeral will be conducted from the funeral home on Thursday, March 28th at 9:30 a.m., followed by a Funeral Mass in the Immaculate Conception Church (Corner of Beach St. & Winthrop Ave.) REVERE at 10:30 a.m., followed by interment in Woodlawn Cemetery, Everett. George was a lifelong Revere resident. He was born, raised and educated in Revere and is an alumnus of Revere High School, Class of 1958. George enlisted in the United States Army & served his country proudly for his duration during the Vietnam Conflict. When he returned home to Revere, he joined the Revere Fire Department as a Firefighter. A career that George loved and would span 41 years. He rose through the ranks and retired as Sr. Deputy Chief. He married his one & only true love in 1963, M. Yvonne D’Eon & the couple remained in Revere and began their life together and their family. George was always remembered by his family & friends as always being a dedicated family man and working 2 jobs, the Revere Fire Department & as a truck driver for Mass Truck Body & Trailer of Chelsea. As he was busy working 2 jobs, raising his family, he also took his education very seriously and went back to school so he could further his position in the Fire Department. He earned his Associates degree in Fire Science at North Shore Community College. He had a very humble and quiet demeanor. He was a kind man and above all a man of great moral character. He served as the President of the Revere Firefighters Credit Union, Local 926 for well over 20 years. He was a member of Boston Sparks, Box 52 & Monday Night Bowlers of Wakefield. Loving & devoted husband of 55 years to M. Yvonne (D’Eon) Taglieri of Revere. Cherished father of George Taglieri, III & wife Jane of Boston, M. Yvonne Merrill & husband Darren of North Andover and Roberta K. Moeckel of Saratoga, NY. Adored Papa of George Taglieri, IV of Arlington, VA, Zachary W. Taglieri of Boston, Trey A. Taglieri of Burlington, VT., Trevor J. Merrill of North Andover, Emma S. Moeckel & Matthew A. “Matt” Moeckel, both of Saratoga, NY. Dear brother of Barbara Perry of Revere & her late husband Edmund and the late Carol A. McNulty & Marjorie A. Donovan. Proud son to the late George & Margaret R. (DelVisco) Talieri. Lifelong friends of Joann “Googie” Giannino & her late husband Ret. RFD Crescenzo “Christy” Giannino. He is also lovingly survived by many loving nieces, nephews, grandnieces, grandnephews & his large family of Revere Firefighters. Wednesday, March 27th from 4:00 p.m. to 8:00 p.m. In lieu of flowers, remembrances may be made to the Revere Firefighters Association – Local 926, Attn: Scholarship Fund, 400 Broadway, Revere, MA 02151. To George’s family, I was a classmate of George’s from the 8th grade on and always found him to be a wonderful person. His stewardship with the Revere Fire Dept. reflected credit upon himself and the city he served so well. Rest in peace! I am so terribly sorry for your loss of George. He was such a friendly man to talk to on Monday nights at the Saugus Bowling League in Wakefield. I will surely miss him as will the whole league I’m sure. My sincere sympathy to Yvonne and the whole family. I am so sorry for your loss. “Deputy Tag” was one of a kind. I learned so much from him, and I’m sure everyone on the RFD would say the same. My thoughts and prayers are with all of you. George was a wonderful man. Our hearts are broken. George was such a kind and gentle man – we both loved chatting with him on Sundays. We will miss him so much. Holding you close in prayer as you continue this walk. A Great man, a firefighter, a friend, He will be missed. R.I.P.